Depending on what age you are, you may be very familiar with Green Day’s album “American Idiot”. Released in 2004, it was a Grammy award-winning release that featured songs like “Boulevard of Broken Dreams,” “21 Guns,” “Wake Me Up When September Ends,” and “Holiday”. The album was the band’s 7th studio album and was a concept album, dubbed a “punk rock opera” by the band members. It was always an obvious choice for a conversion to the stage, and low and behold, five years after its release, the musical became a reality in the Berkeley Repertory Theatre and later in St. James Theatre on Broadway. The production won two Tony awards and later went on to be nominated for Best Musical in 2011. Set just after the fall of the twin towers in 2001, it tells the story of three young men growing up in small town, America. They decide to leave for a big city, but one of them never gets the chance, as Will’s (Samuel Pope) girlfriend becomes pregnant. The other two characters go in very different directions. Tunny (Joshua Dowen) joins the army and goes to war in Iraq. The other, Johnny (Tom Milner) falls under the influence of St. Jimmy and starts to dabble with drugs. This is a production by Selladoor that is touring the UK, with Dublin its only location in Ireland. While the cast don’t exactly have excellent punk rock credentials, they are regulars on stage. 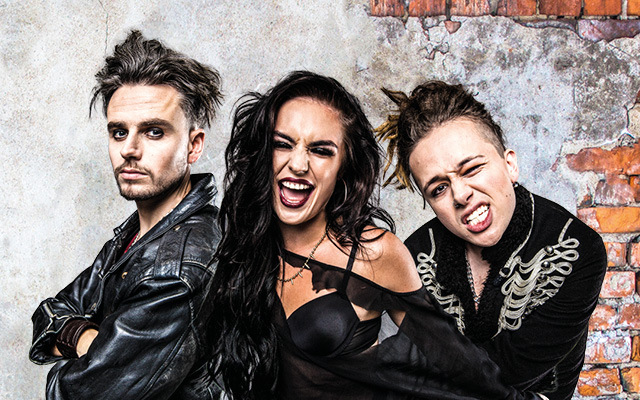 Two members of the cast made it to the finals of X Factor, in Luke Friend (as St Jimmy) and Sam Lavery (as Whatsername). Tom Milner stars as Johnny, who you may know from the BBC drama Waterloo Road. The production is set in a graffiti-covered, concrete world. There is a platform on the back wall of the set where a three piece band perform, with guitar, bass and drums, much like Green Day themselves. They are a very competent band and perform all the hits with style. There are also occasional flourishes of the violin to alter the mood for the more poignant scenes. Punk rock is about anarchy and is very far removed from the world of stage musicals. If you’re looking for wild rebellion, you won’t find it here! You will get solid cover versions of the Green Day classics, and let’s face it, you’re unlikely to ever see Green Day play the Gaiety! The production should suit any fan of the band, or of rock musicals in general. While there is a plot, there is a strong emphasis on the music and you’re quickly moved from one track to the next. There is a massive cast with up to 19 performers on stage at various times. The choreography is impressive with some stylish dance numbers, all done to a punk rock theme! This is an easy choice for the ageing punk in your life. It’s not exactly edgy or avant-garde but it is a well made moment of pop punk!